It’s no secret that artists don’t make the living they used to in the music business. The shift to digital content consumption changed everything; the chances for artists to earn a viable living as musicians are slimmer than ever. Streaming services like Spotify and Rdio provide a revenue-generating, legal framework for listeners to get unlimited access to streaming music. But my sense is that these services, while providing a great outlet, don’t generate meaningful income for many artists. 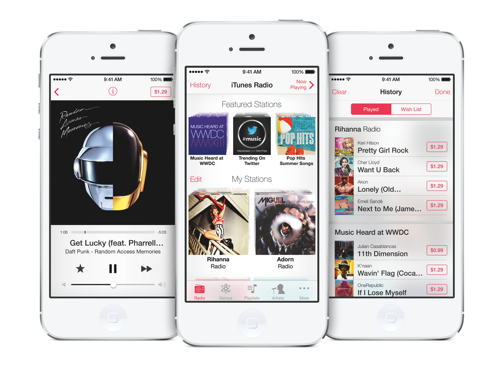 With the introduction of iOS7, Apple launched iTunes Radio. It’s a streaming service similar to Pandora where the user chooses a station and iTunes takes it from there. Once in a while you hear a commercial. You can read more details in Rolling Stone’s review. As with most things Apple does, there are implications and ideas that could be applied to the digital music industry.What I love about iTunes and Apple is that part of their philosophy is that artists and creatives should be generously compensated. This has been built into iTunes from day one when it emerged as a viable competitor to Napster. In some ways radio is as a music marketing platform. Streaming singles are free samples. We don’t own music we hear on the radio, but we’re exposed to it. We don’t buy tracks from the radio. Take a taste, and if you like, it buy the album. Historically there has been heavy curation in the form of stations and DJ’s selecting the music to play. Now online radio services can customize stations based on the users taste. I believe that if this scenerio is going to be optimized for digital, there has to be a fully integrated radio/music store with mass adoption. Enter iTunes. Integration doesn’t just mean the same company owns the radio station and music store. Integration means that they entire experience was designed to compliment itself – using iTunes Radio to market artists and drive sales in the iTunes music store. I’ve spent some time using iTunes Radio, and one observation is that I see more new music surfaced than in other services. For example, I tried the Miles Davis & the Cool station and heard songs not only by Miles Davis, but artists like Them Crooked Vultures. Led Zeppelin radio surfaced tracks by Portugal, the Man and Dearhunter. This has great potential for new artists! iTunes Radio prominently displays your listening history and has a tightly integrated wish list feature. While a song is playing, you’ll see the price prominently displayed on the top right of the screen. Click the price, and the button text changes to buy song. One screen, two taps to go from discover to purchase a track. Not bad! Whenever Apple is designing media products, they think not only about how to get as many people as possible to use the service, but how to maximize the value for artists. Other companies like Netflix have seen success following Apple’s lead by taking a more artist-friendly approach to content creation. That’s what I like about iTunes Radio. And, that’s why I doubt Apple will offer an unlimited streaming service.